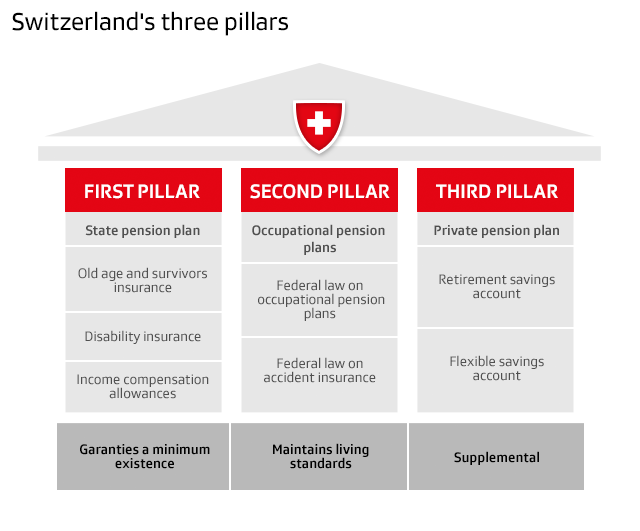 In this article, Lucy Peel, a member of the sales team based out of our global HQ in Neuchâtel, Switzerland, will provide you with a brief explanation as to how the three-tiered Swiss pension system works. Lucy has several years’ experience in the recruitment, payroll and employment space in Switzerland and therefore ideally based to explain the complexities of the various insurances and pension systems. The first pillar is the state pension plan and consists of various insurance schemes. The first scheme known as the AVS in French and AHV in German, is the state pension plan. This is a general insurance, and its purpose is to cover the basic living costs in old age or the death of a parent or partner. The second scheme in this first pillar is the disability insurance, also known as AI or IV. Its aim is to ensure and support the livelihood of those who suffer from a disability. These contributions are mandatory for all residents in Switzerland, regardless of your nationality. You will also not get any gain out of it, until you retire or if you have an accident that disables you to work. The second pillar is the occupational pension plan and accident insurance. This is shown on a payslip as LPP in French or BVG in German. This pension plan is mandatory and funded by salary contributions. In other words, any worker that earns more than CHF 21’150 per year is automatically insured by their employer’s second pillar pension fund. The employers’ contribution is higher than the contribution of the employee as their contribution should be at least equal the sum of the contributions of all its employees. The amounts are fixed by the regulations of each pension fund body, and they are usually set on a scale depending on the age or the worker. Included in this second pillar is also the mandatory accident insurance. All workers in Switzerland are covered by the accident insurance, of their employer, and this is for any professional or non-professional accident. The last pillar is non-mandatory and is used as a private pension fund. This third pillar is an individual option that workers can use to help make up the remainder of their income not covered by the first two pillars. There are two different private pension schemes, and these schemes can be taken out with an insurance company or with a bank. The third pillar can also offer tax advantages. The three-tiered pension system is mainly of interest for Swiss Residents that are planning on staying in the country for a lifetime rather than a contractor that is here for a short amount of time. It should be noted however that as an expat contractor working in Switzerland it is still mandatory to contribute into the first two pillars regardless of whether you already have something set up in your home country. Furthermore, you will only see the money that you have contributed into the system upon reaching retirement.